In Project-centric organizations, different aspects of projects are usually stored in different systems. Proteus makes it easy to visualise and interact with this disparate data in highly graphical ways. It can efficiently collaborate data from multiple systems. 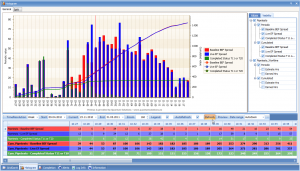 Lets you integrate/ Consolidate planning data from different planning systems. E.g: Primavera, Tilos, databases, spreadsheets and more. Track changes to your plans relative to any snapshot. Reporting and analysis on your live data across systems. Rich interactive dashboards presenting data from multiple sources for GAP analysis. Unique analysis capabilities - custom KPIs in the dashboard. Link rich data to network diagrams or location diagrams. And much more… here are just a few examples…. Proteus offers the possibility of being an application framework - where a dynamic User Interface (UI) layer can be built on top of your existing data. We call this feature in Proteus the “Data Layout”. 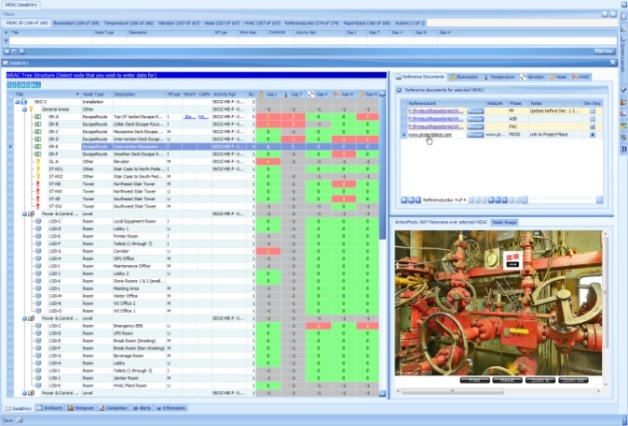 Proteus has a unique and extremely powerful analytical engine that can be used to add a layer of configurable business logic. 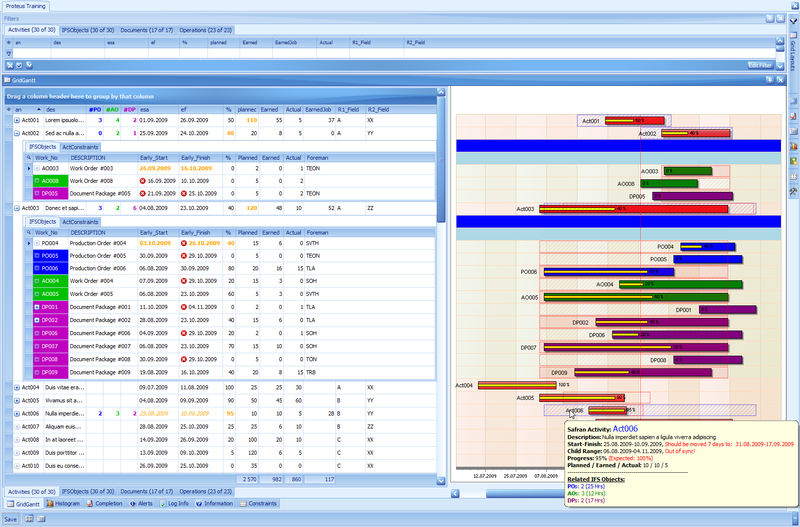 A typical usage of the Data Layout is to build custom KPI dashboards, as seen in the screenshot above. A tree structure reflects the areas on an installation, and for each selected area it is possible to log observations regarding various WE factors (noise, illumination, HVAC, etc) and compare these to the required area limits - for a Gap Analysis. Relevant documents may also be linked to each area, as well as multimedia content - such as interactive 360 degree panoramic pictures from ActionPhoto International. 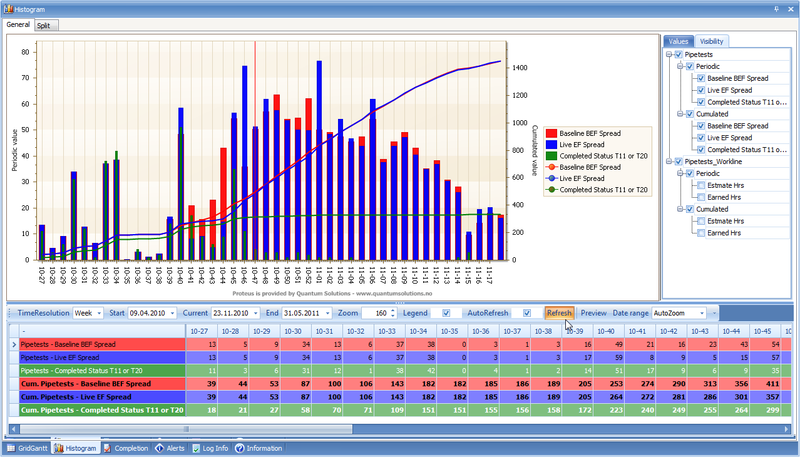 Make ad-hoc Pivot Chart reports. Highly customizable drill down KPI Dashboard(s). Proactive “Watchdog Alerts” – detect deviations early. The screenshot above shows how bars and markers in Proteus can be colored and styled to feed the user with information about the loaded data. In this particular configuration, a red bar means that the activity has more than 10.000 hours - and should therefore get more attention than other activities. 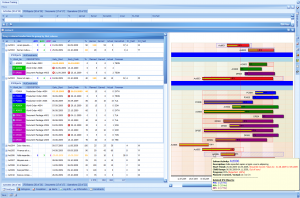 A blue hatch bar shows the time-range for the activity’s underlying jobs, and a hatch brush indicates that they are outside the activity’s time-range. A red frame is shown to indicate there the activity should have been in time, had it been on schedule. A green progress bar indicates 100% complete. …But Proteus has infinite other ways of showing your particular data. GAP Analysis between planning data and other live data sources. 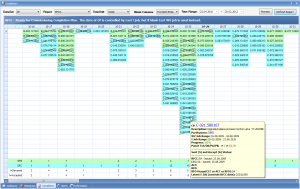 Proteus has a Gantt Chart that can show data from any number of hierarchically related sources. It allows editing data directly in the Gantt, by dragging and dropping bars. Data may also be edited in selected columns in the grid – where each column can easily get its own custom editor control, such as dropdown, slider, popup textbox, etc. Changes made to data may be saved back to source, and this feature can be controlled by Group membership. 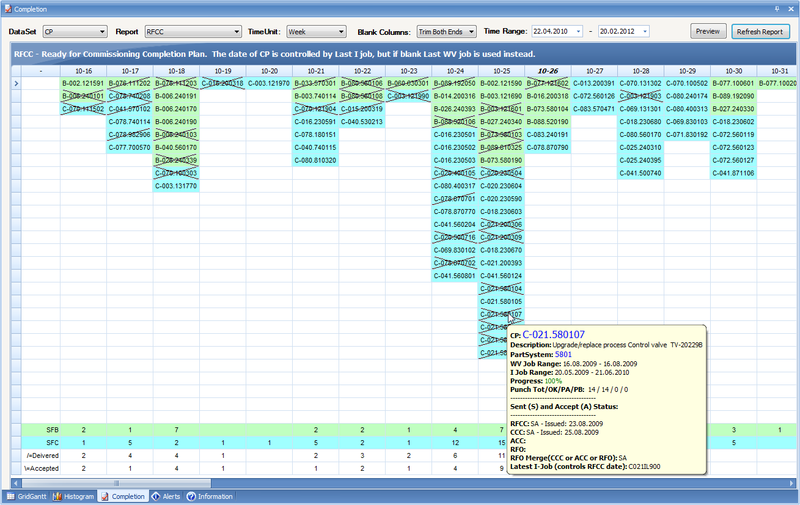 As seen in screenshot, it is possible to define informative tooltips when hovering over bars in the Gantt, or in grid. These may in fact contain aggregated values from lower level (hierarchical) data – letting the user see relevant information from lower levels without having to switch to the system containing this data. 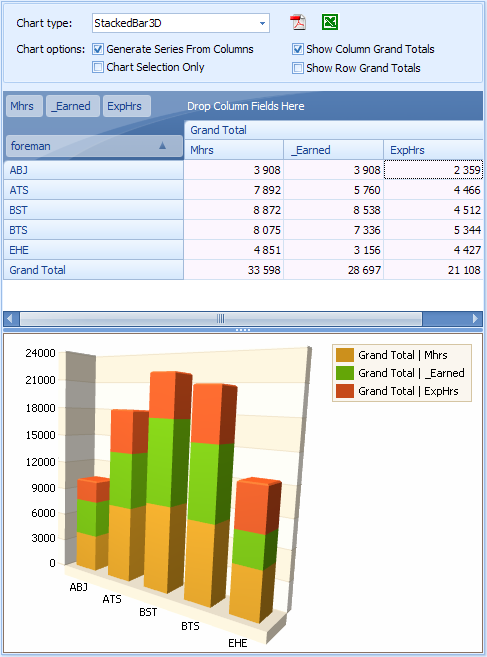 Proteus can be set up to time-phase data from as many sources as required, and show the result in a superimposed histogram. This may be particularly useful when comparing related sets of planning data, to identify where discrepancies occur. 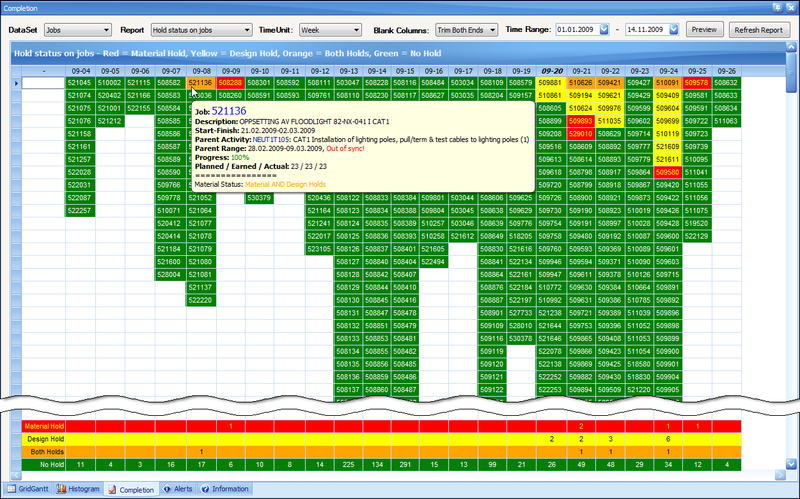 A typical example is comparing the histogram from Task level with its underlying job-cards. For any given (filtered) discipline, the curves should be more or less identical up ‘til today’s date, but the weeks leading into the future may reveal “holes” in the job-setting (the process of translating activities into job-cards) process. Another typical use of the time-phasing capability of Proteus, is to make “counting curves” showing how many items have been planned to be completed a given week (or other time-unit, such as month), and comparing it with how many have been earned (or completed). This may be an important Earned Value metric to monitor. Each column represents a week (or other time-unit, such as month), and under each of these a list of objects are shown that typically should be completed in this week, or in some cases should start this week (depending on how the report is defined). The objects can, depending on the criteria set up for the report, be given visual properties, such as color, font-styles, diagonal lines, etc. to reflect certain attributes of interest. At the bottom of the report, summary rows show statistics for each of the defined criteria. 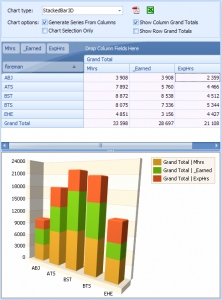 Each cell can show useful detail data in a tooltip – this can be generated from aggregated lower level data. The ideal usage for such a report format is Mechanical Completion, but can be used in numerous other ways – for example (as shown on front page of this document) to indicate which jobs have material and/or design hold. Jobs are shown according to their starting date, and the color is red if it has “material hold”, yellow for “design hold”, and orange for “both”. Green indicates “no hold”. The eye can immediately see which jobs need to be rescheduled due to “holds”. It is very common to take data from a system and cut and paste it into Excel in order to do pivoting. With Proteus software, you can create permanent or ad hoc pivot reports (with over 30 different chart types) for each of the sets of loaded data. For hierarchical data, it may be useful to “inherit down” values from a higher level down to its children, so that pivoting can be made at the lower levels while containing pivot data from higher (parent) level(s). 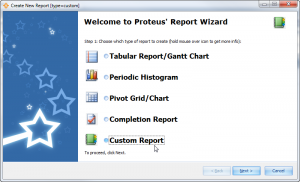 Proteus software has a report wizard that allows making a report in a matter of minutes and recreating it at a later time in seconds. 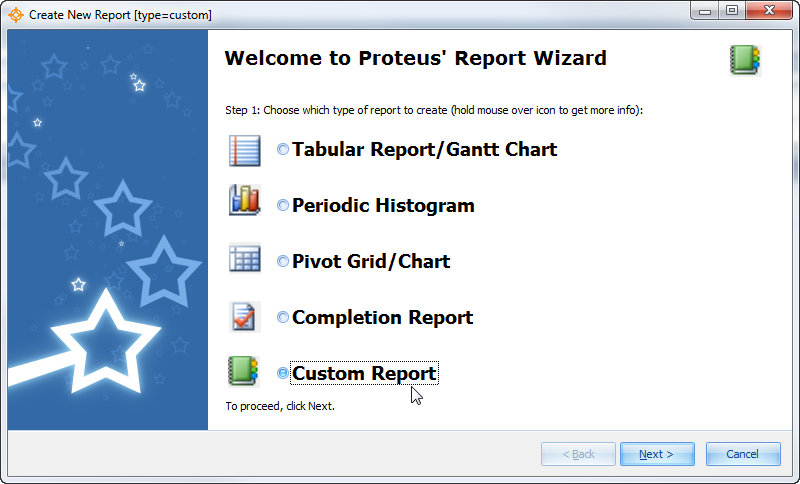 The report designer in Proteus is built on market-leading technology and offers virtually any type of output format. A multi-functional data integration and analysis system. The uses of Proteus software are many and varied. Any project centric organisation that wishes to interact with live data in highly graphical ways will be able to benefit from Proteus. Typically, our customers implement Proteus for to meet one need and then later find new uses for Proteus in other aspects of their businesses. This is partly due to the quick deployment time of Proteus as well as its unique features. Contact us to discuss further how Proteus might help your organisation.